‘There is no better choice- you might as well agree. 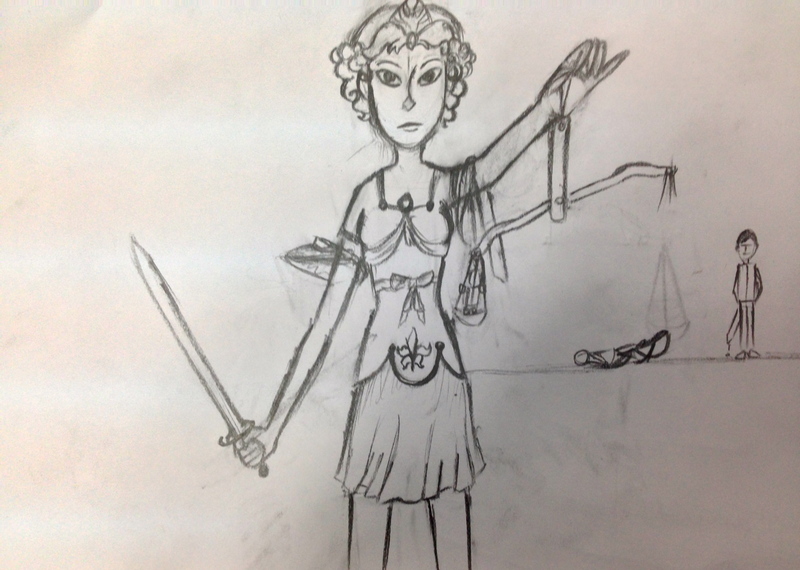 If you resist …you will die!’ written by Suraj, illustrated by Shania showing ‘Justice’ with the mask of impartiality torn away and the balanced scales of justice damaged. ‘Resistance’, or the lack of it, is one of the the themes we see running through our readings this week and for the next few weeks. We spent time discussing the meaning and then teasing out the connotations of what we understand first before rushing thoughtlessly to resources. Under what circumstances is resistance positive? When might it be a moral imperative to resist? What are the qualities of resistor? What are the antonyms of resistance? Of course our immediate thoughts and musings will alter and adjust to accommodate new learning and discovery but by beginning with what we think we know as group, immediately throws up a host of questions and so begins the investigative process. One student hypothesis for the morphemic analysis of resist was *<re +siste+ance> while another was *<re+siste + en+ce>. I was glad the analysis with *<siste> had occurred. These analyses show how some students had glommed onto a pattern about reinstating the final non-syllabic <e> without thinking about the circumstances under which this does and does not occur. cause a single vowel to be ‘long’ as seen in <hate>. However, ‘Awas!’ (danger) as we say here in Malaysia. Never assume this is the only role of this humble grapheme <e> when in the final position of a base. Consider ‘have’, ‘love’, ‘shove’, ‘give’. Nary a long vowel phoneme in earshot! Merely the principle that no English word will end with <v> instead write <ve>. prevent a single consonant letter which is preceded by a single vowel from doubling under certain circumstances. prevent plural confusion as in ‘horse’. Without the <e> we may assume more than one *<hors>. One of the several roles of <e> is to nullify that potential ambiguity. It was in the end the recognition of other members of the family, those sharing the same base element- such as <resist>, <persist> and <insist> that proved the lack of <e> and allowed us to proceed to :<re+sist+ ance>. ‘Resistance’ as a noun has been around since the mid 14th c. It’s meaning from Latin resistere is to make a stand, to oppose. In 1939 the term extended to include the concept of an organized, covert position. Through our readings of Nazi Germany and occupied France, we could connect with this. The verb resist is slightly younger than it’s noun relative, first attested in late 14th century. It was here, digging around in the ‘resist’ entry, that we uncovered more about the root: Latin sistere to take a stand, to stand firm. In this entry we were nudged towards assist – obviously sharing the same base element<sist>. It was here, ‘assisted’ by assist, that we glimpsed the depth, breadth and enormity of this ancient Proto Indo European root, the name for the family of languages that amongst hundreds, includes English. The tree here shows the sub- families including the three key groups that effect English: Germanic, Greek and Italic. This name has been applied to what is supposed to be the original language. The Proto Indo European language, many argue, was spoken at least 5, 500 years ago. Latin ‘sistere’ is spawned in the PIE root *si-st- a ‘reduplicated form’ of the PIE root *sta’. This then intensifies the meaning so not simply ‘stand’ but ‘ to stand firmly’. This much was discovered by one student who comes in to the class before school to learn handwriting (the beautiful and highly practical ‘Chancery’ of Real Script) and through these ‘handwriting’ sessions, has been working on uncovering the backstory, to reveal the ancestors of the words: resist, stand, consist, exist, statue, and stay. His work below, he realizes, is just the tip of the iceberg. He is determined to find a clear way to represent this and share his discoveries with the class. Stay (should that be <st+ay>?) with us for the next installment, where the status of this base and the intricacies and spread of the root will be revealed! No rest for our budding etymologist, no matter the cost, he remains constant to the task. The status of this root is simply arresting!! A brief sidestep from the intended path of resist, a mere jump on a track to the left, lured by the irresistibly erudite William Jones. William Jones, an 18th century philologist, polymath: poet, lawyer, anthropologist, lawyer, judge, and botanist is renowned for recognizing and discussing the connection between Sanskrit, Latin and Ancient Greek. What a prodigious mind! Thirteen languages tripped lightly from his tongue and the modest claim that he knew another twenty-eight ‘reasonably well’ by the time he died! His father, a mathematician creator of the mathematical term ‘pi’, died when Jones was three. Despite this setback, his mother’s novel educational approach was to provide our young lad with access to a wide range of books accompanied by the injunction: ‘Read, and you will know!’ Oh, if it were only that simple! Nevertheless, by seven the young Jones must have obeyed his mother’s glorious command as he won a scholarship to Harrow School where his linguistic prowess soon became apparent:, ‘translating and imitating the Greek and Roman classics, teaching himself Hebrew, learning Arabic script, taking the lead in a tragedy he wrote entitled ‘Meleager’, and, having acquired more Greek than the headmaster, Robert Carey Sumner, gaining the nickname ‘the Great Scholar’. By the age of 26 Jones was hanging out with Dr Johnson ( of dictionary fame) and the other ‘luminaries of the Enlightenment: Fox, Pitt, Boswell, Georgina Duchess of Devonshire, Garrick, Sheridan,Reynolds.’ Jones studied law, which led to India. Knighted at 37 , he was appointed as High Court judge in Calcutta. He did more than any other writer ‘to destroy Eurocentric prejudice, reshaping Western perceptions of India and the Orient.’ (Franklin, M). The climate, stress and inflammation of the liver sadly took its toll on Jones and he died in Calcutta at 47 but leaving in his wake a translation of Hindu and Muslim laws which apparently paved the way for self government. If you are intrigued by the scholarly efforts to reconstruct this language, then now for the ‘pièce de résistance’, listen to linguist Andrew Byrd below recite “The Sheep and the Horses” the PIE fable written in 1868 by German linguist and PIE enthusiast August Schleicher. Illustration at the post’s beginnings is by Suraj and Shania for the second of our Tiny Tales series. Watch this space!